Television, you say? How does “Reality Investing” work for you? Drama. SeaChange International has a very complicated business in both its products and its customers. However, as investors, we don’t need to understand either. Unless we are planning on owning the company, our only job is to understand what another investor might pay for what we have and, of course, what we might pay for what they have. For example, just because we like hamburgers and even know how to make them, it doesn’t qualify us to judge the merits of MacDonalds as an investment. And the same could be said for any company that we might invest in but not own- too much information that doesn’t help because running the company is not what we’re about and forecasting earnings does not – believe it or not – have much to do with investment success. It might seem like we’re putting the cart before the horse – shouldn’t we know something about what we’re buying? But that is not the case with investments or, more precisely, what we need to know has very little to do with how the company runs or is running – that’s the job of the company’s management. For example, insiders might know everything about a company but not be good investors whereas other investors might not know anything about the company but still be good investors because they have a nose for the market or the market has a nose for them. Our job is to understand whether it is likely that other investors will buy what we have at a higher price than what we paid for it and that is determined by an excess of demand over supply at the current stock prices which means exactly that the ambient stock prices appear to be above the price of risk. It’s not an easy matter to calculate the price of risk because it resolves a Nash Equilibrium between risk-seeking and risk-averse investors but if we don’t have our computers handy and are interested in buying the stock, we can buy it at the current stock price and watch the stop/loss so that we don’t lose too much of our money – if that’s the case – and jack it up once we’re in the clear (should we be so fortunate). The point is that we know that the price of risk exists and that it is unique within the constraints of the data. Therefore, it’s worthwhile to look for it, take a guess, and confirm our guess with its properties. 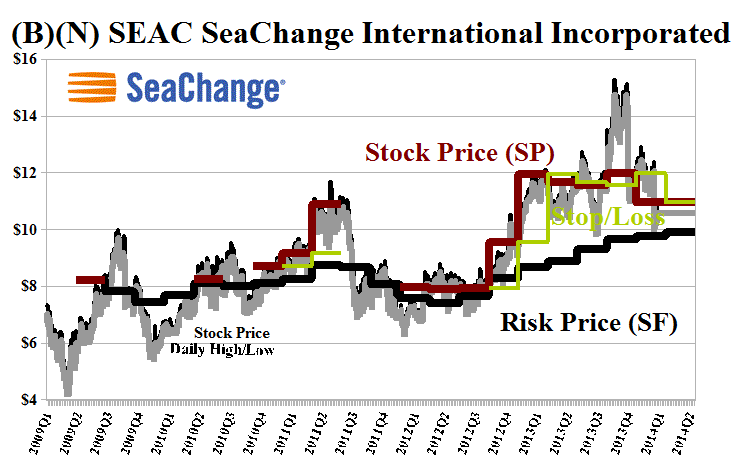 For example, SeaChange was trading at $8 in June and July 2012 and getting strong price support between $8 and $10 by the end of the year. The calculated price of risk, the Risk Price (SF), was about $8 at that time (please see Exhibit 1 below) and it was therefore trading at or above the price of risk and we could buy it for the Perpetual Bond™ at prices between $8 and $9 with reasonable confidence that “demand exceeded supply at those prices” and, therefore, even without a computer we could estimate the price of risk at about $8 and we were not sold out until the stop/loss at $12 nearly a year later and again recently. Our current estimate of the price of risk is $10 and we also estimate the downside in the stock price due to the demonstrated volatility as minus ($1.50) during the next three months so there’s no compelling reason for us to buy the stock back at the present time. But not to worry. There are hundreds of opportunities because we choose to invest only in reality – we want our money to be safe – 100% capital safety – and to obtain a hopeful but not necessarily guaranteed return above the rate of inflation. SeaChange International Incorporated is a developer, manufacturer and marketer of digital video systems and services to cable system operators, telecommunications companies and broadcast television companies. From the Company: SeaChange International Incorporated provides multi-screen video products and services that facilitate the aggregation, licensing, management, and distribution of video, television programming, and advertising content to cable system operators, telecommunications companies, broadcast television companies, and mobile communications providers worldwide. It offers back-office products, including SeaChange Adrenalin, a multi-screen video back office platform that enables video service providers to manage, monetize, and deliver a seamless viewing experience to subscribers across multiple devices at home and on the go; and SeaChange Nitro, a multi-screen user experience application that enables video service providers to seamlessly present linear, time-shifted, and on-demand content across mobile, PC, and television screens. The company also provides advertising product solutions, such as SeaChange Infusion advertising platform that represents the transformation of television ad technology into an enhanced monetization platform that unites television and Internet ad operations; and SeaChange AdPulse advertising software platform that maintains ads and video-on-demand content in separate databases. In addition, it offers in-home gateway product solutions, which include SeaChange Nucleus for the delivery of video and applications throughout the home. Further, it provides professional services, installation, training, project management, product maintenance, technical support, and software development related services. The company sells and markets its products and services through a direct sales organization, independent agents, and distributors. SeaChange International Incorporated was founded in 1993, has 720 employees and is headquartered in Acton, Massachusetts.